“This study showed that a deep learning model can be trained to detect wrist fractures in radiographs with diagnostic accuracy similar to that of senior subspecialized orthopedic surgeons. Additionally, this study showed that, when emergency medicine clinicians are provided with the assistance of the trained model, their ability to detect wrist fractures can be significantly improved, thus diminishing diagnostic errors and also improving the clinicians’ efficiency." In this work, we developed a deep neural network to detect and localize fractures in radiographs. We trained it to accurately emulate the expertise of 18 senior sub- specialized orthopedic surgeons by having them annotate 135,409 radiographs. We then ran a controlled experiment with emergency medicine clinicians to evaluate their ability to detect fractures in wrist radiographs with and without the assistance of the deep learning model. The average clinician’s sensitivity was 80.8% (95% CI, 76.7–84.1%) unaided and 91.5% (95% CI, 89.3–92.9%) aided, and specificity was 87.5% (95 CI, 85.3–89.5%) unaided and 93.9% (95% CI, 92.9–94.9%) aided. The average clinician experienced a relative reduction in misinterpretation rate of 47.0% (95% CI, 37.4– 53.9%). Misinterpretation of radiographs may have grave consequences, resulting in complications including malunion with restricted range of motion, posttraumatic osteoarthritis, and joint collapse, the latter of which may require joint replacement. Misdiagnoses are also the primary cause of malpractice claims or litigation. There are multiple factors that can contribute to radiographic misinterpretations of fractures by clinicians, including physician fatigue, lack of subspecialized expertise, and inconsistency among reading physicians. 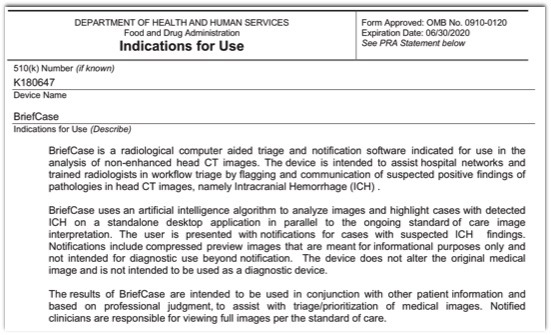 Thus, we speculate that, someday, technology may permit any patient whose clinician has computer access to receive the same high-quality radiographic interpretations as those received by the patients of senior subspecialized experts. 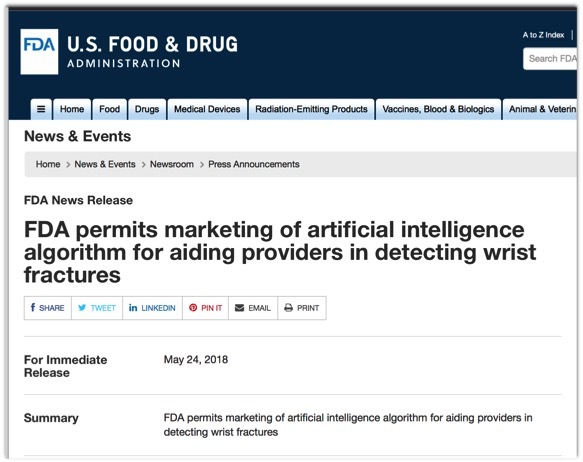 One of the biggest potential bottlenecks that could inhibit or derail AI development and adoption in health care is the availability of sufficient quantities of high-quality data in standardized formats. As noted earlier, information today is highly fragmented and spread across the industry, residing in diverse, mostly uncoordinated repositories like electronic medical records, laboratory and imaging systems, physician notes, and health-insurance claims. Merging this information into large, integrated databases, which is required to empower AI to develop the deep understanding of diseases and their cures, is difficult. "Deep learning–based approaches have the potential to maximize diagnostic performance for detecting cartilage degeneration and acute cartilage injury within the knee joint while reducing subjectivity, variability, and errors due to distraction and fatigue associated with human interpretation." Skeletal bone age assessment is a common clinical practice to investigate endocrinology, genetic and growth disorders in children. It is generally performed by radiological examination of the left hand by using either the Greulich and Pyle (G&P) method or the Tanner-Whitehouse (TW) one. However, both clinical procedures show several limitations, from the examination effort of radiologists to (most importantly) significant intra- and inter-operator variability. To address these problems, several automated approaches (especially relying on the TW method) have been proposed; nevertheless, none of them has been proved able to generalize to different races, age ranges and genders. In this paper, we propose and test several deep learning approaches to assess skeletal bone age automatically; the results showed an average discrepancy between manual and automatic evaluation of about 0.8 years, which is state-of-the-art performance. Vertebral Body Compression Fractures and Bone Density: Automated Detection and Classification on CT Images Burns JE et al. *A fully automated machine learning software system with which to detect, localize, and classify compression fractures and determine the bone density of thoracic and lumbar vertebral bodies on CT images was developed and validated. * The computer system has a sensitivity of 95.7% in the detection of compression fractures and in the localization of these fractures to the correct vertebrae, with a false-positive rate of 0.29 per patient. * The accuracy of this computer system in fracture classification by Genant type was 95% (weighted k = 0.90). * A fully automated machine learning software system with which to detect, localize, and classify compression fractures and determine the bone density of thoracic and lumbar vertebral bodies on CT images was developed and validated. * The computer system has a sensitivity of 95.7% in the detection of compression fractures and in the localization of these fractures to the correct vertebrae, with a false-positive rate of 0.29 per patient. * The accuracy of this computer system in fracture classification by Genant type was 95% (weighted k = 0.90).